A school in eastern China has installed high-tech cameras in classrooms to monitor whether students are engaged during lessons. Three cameras, described as “teaching assistants”, are installed on top of the blackboard and part of the school’s “Smart Classroom Behaviour Management System”. Through facial recognition technology, they capture student behaviour during lessons and give teachers real-time analysis of whether pupils are enjoying the class and paying attention. If it concludes that the student is distracted during class, the system will send a notification to the teacher to take action. The system also tracks classroom attendance by comparing those present against a database of pupils’ faces and names. 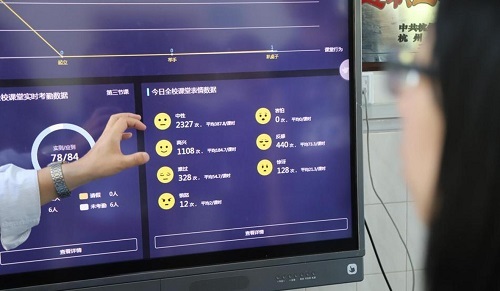 “Using this system we see which classmates are concentrating in class and whose mind is wandering,” Ni Ziyuan, the school’s head teacher told Sina News. The school said the system will also help to monitor teachers’ classroom technique – and hopefully improve their practices. “This kind of system is supervising both the students’ learning and the teachers’ teaching,” said deputy principal Zhang Guanchao. Thus far, it has been installed in one classroom but would be deployed across the school by summer, said the school’s headmaster. There has already been report of a change of behaviour in students due to the increased monitoring. One student who used to fall asleep or flip through other textbooks during classes that didn’t interest him now feels pressured to pay attention. How will such applications of technology affect student learning in the long run? Share your thoughts below. Are virtual classrooms the future of learning?